ladies are more sugary than others, some more bleak. 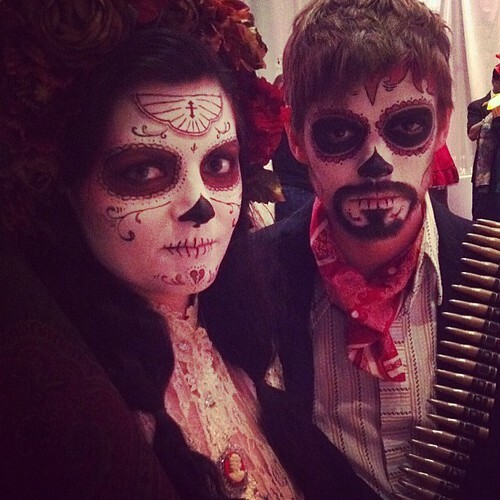 All are sacred – death’s daughters, calaveras lindas. Ruby Joule photographed by Jeremiah Newton for the recent Beautiful Monsters show from Coco Coquette. From “Giving up the ghost” in issue #3 of Sokozine. The photographer is Emir Eralp. Amelia Foxtrot, also by Jeremiah. 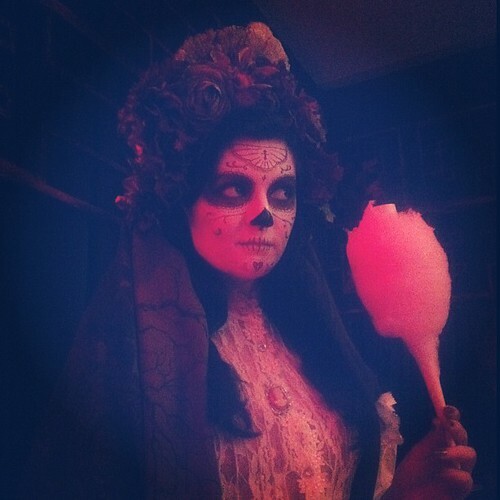 My friend Erin Free-man in her exquisite Catrina ensemble, eating cotton candy at this year’s Ghoul Ball. She did such a fantastic job on both her and her beau’s maquillage! Love the autumnal hues. This, and the next two photographs are all by John Rees. I love this makeup my friend Liz did a few years back. Those pictures are amazing! Inspiring. I rarely comment. But now I must say, your posts often have me searching for more all over the net. Thanks! Fantastic work. The images provoke such an interesting mixture of reactions. Oh Miss Ghoul! I can always count on you to sleuth out an elusive snippet! Tin Eye was down last night, and I wanted to get this up… Thank you, darling! You know…Tin Eye was great when it was the only game in town, but I find that Google reverse image search works really well too, maybe even better! I was so excited when I heard they were including that functionality, have you used it yet? Give it a try! As with Tin Eye though, it will provide you with the data, but you have to be willing to sort through all the crap to get to the infos you need. Still – way better than no options at all and mysteries that are impossible to solve!